The California fuchsia is a showy perennial shrub that grows 1-2 ft. high with upright stems. It has gray-green foliage and bright orange-red tubular flowers and attracts hummingbirds. 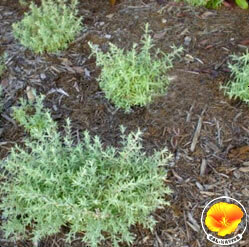 This shrub is a native to California and is drought tolerant. -Cornflower Farms. Note: It is also known as Epilobium in some books and Botanic Gardens.